Most of you expected macarons when I posted that salted caramel macarons. SURPRISE! I actually didn’t use the salted caramel for the macarons. Not right away at least. 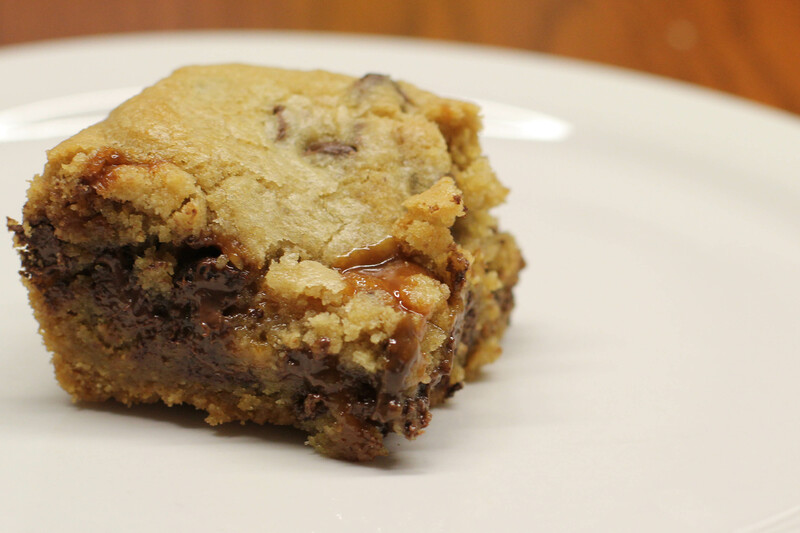 Some of you might remember my peanut butter blondies, this is kind of similar to that. For those of you wondering: blondies are brownies, just without the chocolate. Now before you go on freaking out about why I haven’t posted a single brownie recipe, just wait. It’s coming. When I first started making the recipe I was curious to see how they manipulated the chocolate chip cookie recipe, in comparison to my quick chocolate chip cookies. As I started adding the sugar, and the eggs, and the egg yolks, I realized that the recipe was exactly the same as mine. With the addition of two tablespoons of flour. So I proceeded, expecting my chewy chocolate chip cookies. Little did I know, the addition of the salted caramel sauce made things very interesting. 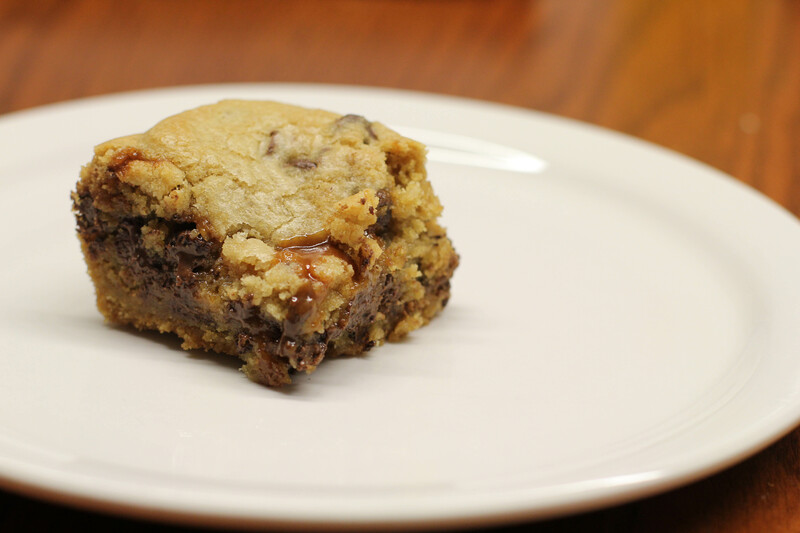 The multidimensional flavors of the caramel contributes to the sweet flavors of the chocolate chip cookie dough. The salt finishes the picture. I added another small pinch of salt. Yes, I’m hooked to salty sweet flavors now. When I made the recipe, I doubled everything and baked it in an 13 by 9 baking pan. I was kind of afraid that the cookies wouldn’t cook all the way through. They didn’t. That didn’t compromise the blondies though! 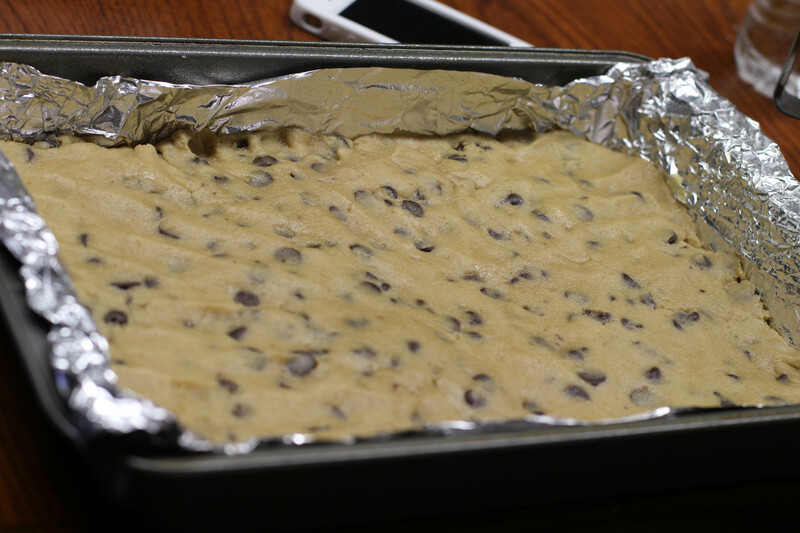 The blondies, like my chocolate chip cookies need some time to set when they first come out of the oven. If you like your cookies cooked all te way through, I’d recommend not doubling the recipe and baking it in a 8 by 8 square pan. Each person I served ended up with 1.5 inch squares. Coming from someone who’s eaten a quart of ice cream in one sitting: these blondies are extremely rich. I love them. But eating too much is bad–don’t do it. Maybe just two squares… or three if you’re having a bad day. And if you are having a bad day, serve this warm with a spoon, and a giant bowl of ice cream. I even left some space on my plate… waiting for its creamy smooth companion. 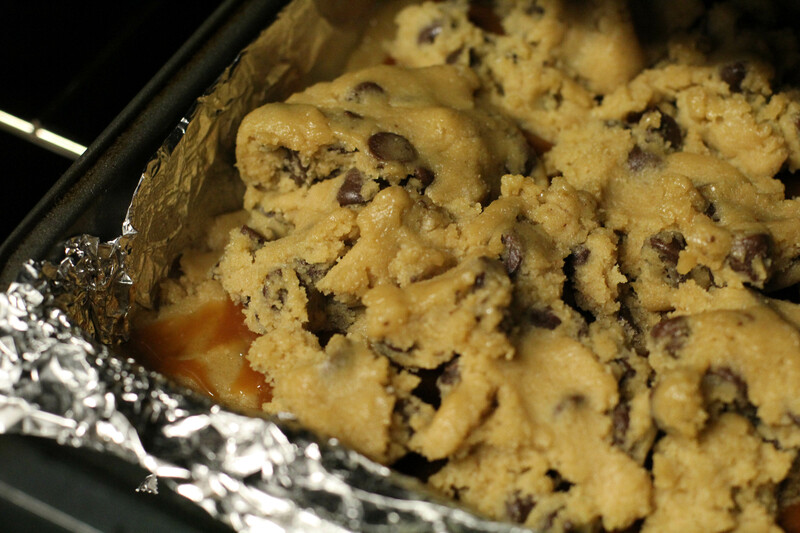 Preheat oven to 325 degrees F. Line an 8×8-inch baking pan with aluminum foil. Spray with Pam for Baking, or spray with pam and dust with flour. 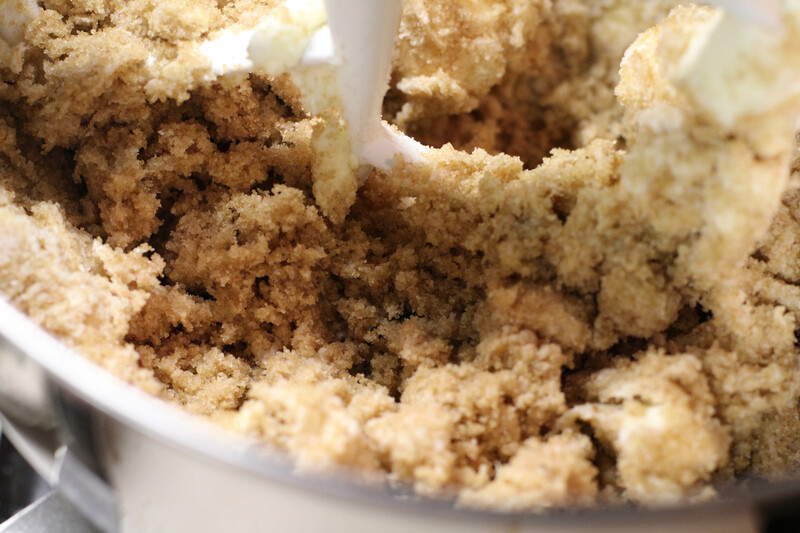 In the bowl of a stand mixer fitted with the paddle attachment or in a large bowl using a hand mixer, beat the butter and sugars together until thoroughly combined. Beat in the egg, yolk, and vanilla until just combined. Add in the dry ingredients and beat at low speed until the mixture is just under-combined, then stir in the chocolate chips. Spread half of the dough out in the bottom of the baking pan. 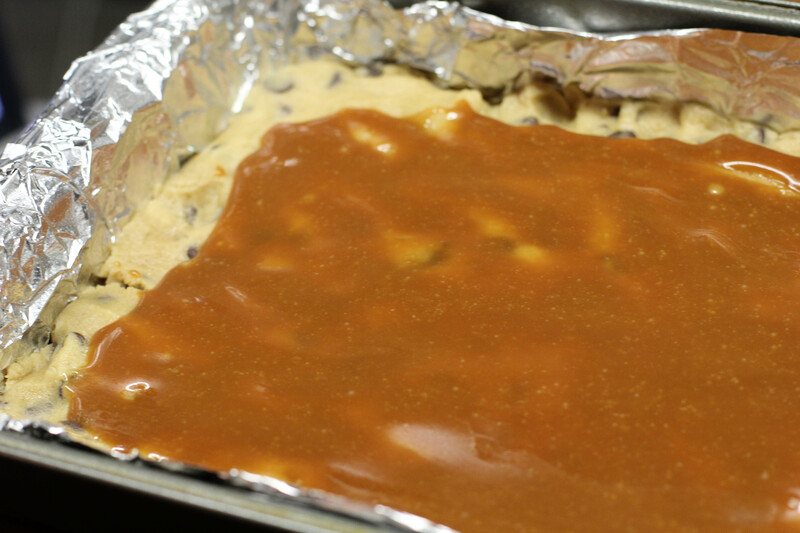 Spread the caramel sauce over the cookie dough and drop the remaining dough in clumps over the caramel – the dough will bake together, so don’t worry if the dough doesn’t cover the entire pan. Bake for 30-35 minutes until a toothpick comes out clean from the bars when tested for doneness. They may seem a little raw, they’ll continue to cook as they cool down. As soon as the bars come out of the oven, sprinkle the top with fleur de sel. Allow the pan to cool on a wire rack for 15 minutes before carefully removing the bars in the foil from the pan. Allow the bars to cool completely before slicing.